For about 14 months I have waited to shoot sunrise at the Coquina Rocks outcropping in Fort Fisher, NC. I have been in town every month for work...and about 10 of those months it was raining and if it wasn't raining sunrise did not coordinate with low tide. 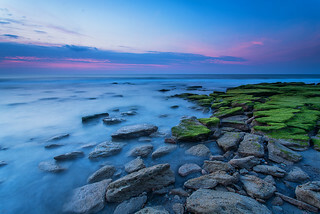 This outcropping is usually covered by high tide, and beach erosion plays a big part in it too...yesterday low tide lined coordinated with sunrise and I got out to shoot. While it might not be the exact image I had envisioned, but I really like what I came away with.